Deep rose pink, loose paeony-form flowers with yellow stamens produced in October and November Upright, dense and rapid growth. Prefers a sunny, sheltered position. Deep rose pink, loose paeony-form flowers with yellow stamens produced in October and November Upright, dense and rapid growth. Ordering a gift long distance is rarely simple, but this one was excellent. I asked for a specific date and it arrived the day before which was ideal. 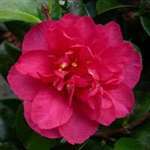 The birthday girl has reported back that the Camelia arrived in superb condition with uncomplicated planting instructions. Postage was little bit expensive. I will definitely use Trehane Nursery again.